This morning we awoke to some dreary weather, not quite what we hoped for our big grand opening. But around 11:15am, we began to see a few kids hanging around out front of the store. At first we thought they were just playing in front of the store, but by 11:3oam even more kids had arrived. Soon we had a significantly established line of anxious fro-yo fanatics waiting to get one of the first 50 Yoasis T-Shirts. As the rain began to come down heavier, we knew it was time to open our doors for business. 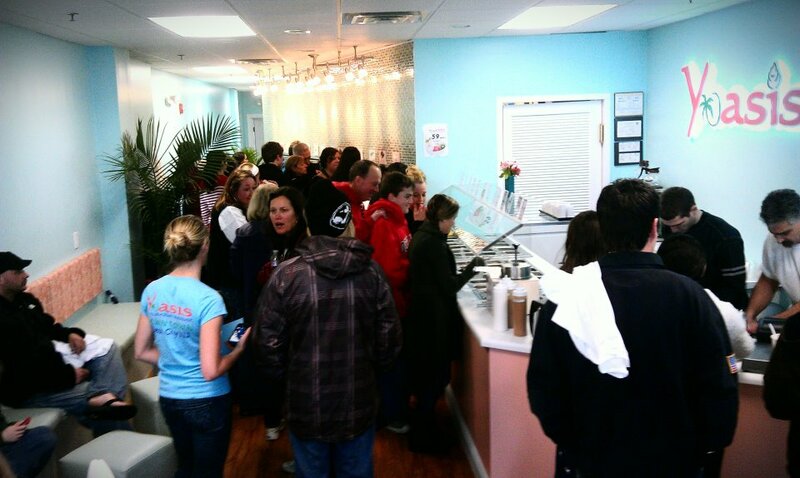 At 5 minutes before noon, over 50 guests flooded Yoasis Frozen Yogurt. The fun continued throughout the day with many new faces and some crazy fro-yo custom concoctions. The afternoon came with clearing skies and another wave of excited guests for our Grand Opening 1/2 Price yogurt specials from 4pm to 7pm. Kids pushed the limits of their cups’ capacity; taking advantage of the great 1/2 price deal! The night came to a close with a few more visits from some fantastic families and friends. We hope everyone enjoyed today as much as we did and hope to see you all again soon! OUR HOURS OF OPERATION ARE : 7 DAYS A WEEK 12PM TO 9PM.